This will be the last salad dish in a series of salad dishes I have presented this month. 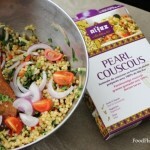 Hoping to go out with a bang by featuring a flavourful and robust salad of pan-seared beef fillet, on a bed of pearl couscous and vegetables. I saved the best for last … and this one was AMAZEBALLS. Happy Chinese New Year everybody! This is my Asian inspired chicken salad featuring sticky sweet chilli and sesame chicken thighs on a bed of greens, dressed with a mandarin orange, lime and chilli syrup dressing. Just in time for the lunar celebrations. 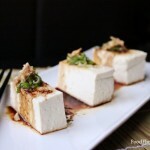 Promised a cold tofu dish as part of the salad month series, and so here it is. It’s hardly a recipe really because it does not require any cooking … merely an assembly of the different components. Ten minutes is all you need to prepare this dish from start to finish … a highly nutritious meal all on its own. Time now for another exciting southeast Asian salad dish, and today I am hopping across the border once again into Thailand. 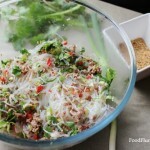 This dish, known as Larb Moo, involves ground pork, fresh herbs and chillies, all mixed in with glassy bean thread noodles. Serve chilled or at room temp for an amazing afternoon delight. 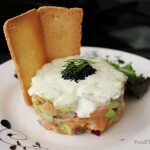 Today is a rather “posh” salad of raw salmon, cucumbers and avocado … simply dressed with olive oil and fresh herbs. 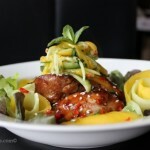 The perfect summertime appetizer to pair with a nice chilled glass of Chablis or sparkling Prosecco. Just make sure you have a plentiful supply of crisp Melba toasts on the side. Salad for the second day running … woohoo! 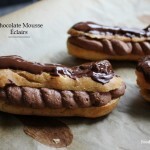 This one promises to tantalize the taste buds with big and bold flavours. 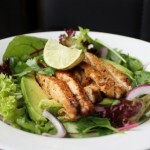 Cajun spiced chicken breast on a bed of salad greens, avocado, red onions, coriander and a wonderfully lite lime-mayo dressing to finish it all off. That’s lunch sorted. 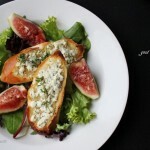 Cooks’ Club Challenge for the month of January is here and the these is SALAD. Down under in Australia it is currently blazing hot, and I suspect everyone will be submitting entries featuring light and cool salads to combat the weather. I, on the other hand, am going to submit a warm version involving grilled goat cheese on toast. Mmmmm…! First Bake Club Challenge of the year, and the theme this month is coconut desserts. Growing up in a southeast Asian culture coconut was present in almost EVERY dessert imaginable … but this time I got to try my hand at fusion cuisine … mingling southeast Asian flavours with European concepts. 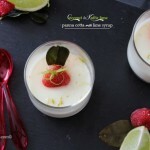 Hence, the coconut & kaffir lime panna cottas with lime syrup.